Vitushkin's conjecture, a special case of Painleve's problem, states that a compact subset of the complex plane with finite linear Hausdorff measure is removable for bounded analytic functions if and only if it intersects every rectifiable curve in a set of zero arclength measure. 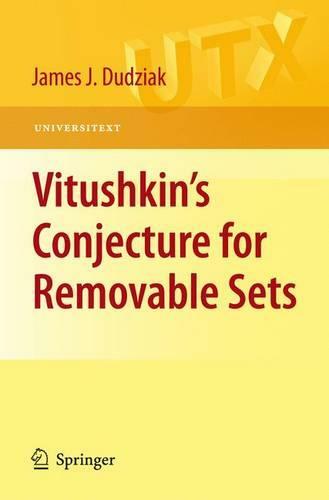 Chapters 1-5 of the book provide important background material on removability, analytic capacity, Hausdorff measure, arclength measure, and Garabedian duality that will appeal to many analysts with interests independent of Vitushkin's conjecture. The fourth chapter contains a proof of Denjoy's conjecture that employs Melnikov curvature. A brief postscript reports on a deep theorem of Tolsa and its relevance to going beyond Vitushkin's conjecture. This text can be used for a topics course or seminar in complex analysis. To understand it, the reader should have a firm grasp of basic real and complex analysis.